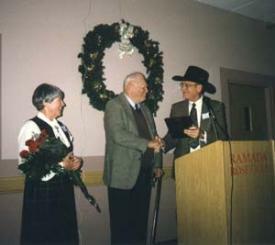 Bob Jordan of Stillwater, Minnesota, was honored as 1999 Horseman of the Year by the Minnesota Horse Council. The presentation was made at the Annual Meeting on January 15, 2000. The Horseman of the Year, a program in its thirtieth year, selects from nominated individuals a horseman who has made outstanding contributions to the equine industry in Minnesota over a long period of time. Jordan was born in Minneapolis but reared in rural western Minnesota where his father was an animal scientist at the Central School of Agriculture in Morris, Minnesota. It was in those early years that he learned about draft horses and developed a life-long interest in the equine industry. After graduating from the University of Minnesota, Jordan served in the US Navy and then began a teaching career. He took a few years off to explore a career in sales of agricultural products. He then joined the Animal Husbandry staff at the U niversity of South Dakota. While there he earned a Masters Degree in Agriculture. He moved on to the University in Kansas whe re he earned his Doctorate. He returned to the University of South Dakota as an Associate Professor. Shortly thereafter, w ith an extensive education earned and a broad experience in agriculture, he settled in at the University of Minnesota to teach animal science and coach livestock judging teams. As the horse industry shifted from farm horses to a recreational light horse industry, Jordan discovered the enormous gaps in information about light horse nutrition and care. He accepted the challenge to develop a course in horse production and serve as the extension specialist for the University of Minnesota. He researched and wrote many publications including such titles as: Horse Nutrition and Feeding, Selecting Your Horse, Horse Care and Management and 4-H Horse Show Guide. He wrote radio scripts to make equine education more assessable statewide. He pioneered tele-lecturing for horse courses using the telephone supplemented by film and slides. That allowed him to teach horse programs interactively in nearly every county in the state. He worked extensively with 4-H and was responsible for the creation of the respected and sought after Dan Patch Award. He was responsible for the first 4-H statewide horse judging contest. He began a centralized clinic for all state 4-H program enrollees. He persuaded the Horse Superintendent at the Minnesota State Fair to set aside one day of Hippodrome (Coliseum) use for 4-H horse activities during the State Fair. With far greater participation than anticipated, the show was moved the following year to the second weekend after the Fair to allow more time and space. That weekend (now Friday through Monday) is still reserved for that show. He supported Dr. A.L Harvey and Albert "Bud" Frischmon in their efforts to organize saddle clubs in the upper Midwest. The organization that developed is the Western Saddle Clubs Association, Inc., the largest organization of its kind in the world. Now retired, Jordan and his wife Ann reside in Stillwater Township. Son Bob lives in Florida, daughtes Barbara and Susan live in the Metro area.